Fangirls, I love cartoons. I always have, and I doubt that is something that will be changing anytime soon. One of my favorite things about cartoons now, is that they become so immersive. I love that not only can I watch Gravity Falls, but I can also play it’s video games, buy the toys, and even read books from the series. Recently, I’ve read a couple books that aren’t just written about the shows that they’re based off of, but they’re written by the characters of the show. I’ve read Steve Universe’s Guide to the Crystal Gems, and now Dipper & Mabel’s guide. It’s fantastic that I get to experience my favorite shows in all of these different ways! As much as I like reading, I love interactivity. I like books that include me; not quite to the point of choosing the story, but I like little quizzes an activities throughout. Dipper & Mabel’s guide has that, and it’s fantastic. Since I loan out my books, I try not to write in them, but instead solve the codes and activities in my head or on scrap paper. I did change the book in one way, though. There was an awesome two sided poster in the back; one side a map of Gravity Falls, the other a Sevr’l Timez poster. I needed that on my wall. Sorry book! This book is phenomenal. 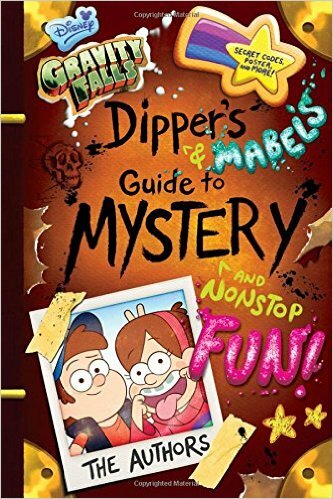 It has bits “written” by the main characters of the show, but is mostly written by Dipper and Mabel. I love how well the characters shine through; Dipper’s parts are very no-nonsense, while Mabel’s are all nonsense! It’s a perfect representation of the characters I’ve grown to love in the show. One thing that really stood out to me, beyond all others, was the inclusion of actual facts for us to earn about while reading. 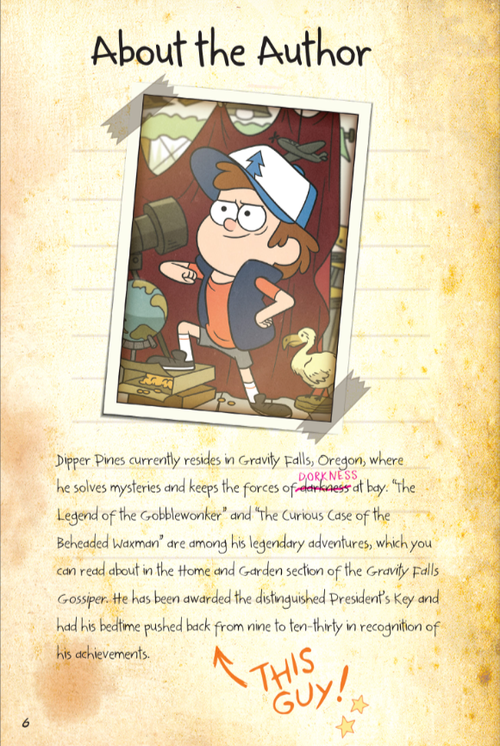 Dipper includes a lot of information on codes, along with some situations that he explains could look like something mysterious is happening, but really isn’t! I think it’s rad that Dipper can step outside of his neuroses a bit, to show people that though things may seem mysterious, they’re usually normal. Altogether, this was a phenomenal book, and I can’t wait to reread it, and share it with my friends! Gravity Falls is an awesome tv show, and if you enjoy it at all, I highly recommend this book!